Product #15691 | SKU ECHOPRO-E34 | 0.0 (no ratings yet) Thanks for your rating! The adapter boosts specialty adapters like RME's HDSPe ExpressCard and interface cards for the AJA io Express as well as the Matrox MX02 family. Install Sony's latest SxS driver* thus enabling support for Sony SxS memory card. This card is used in Sony's popular XDCAM EX line of professional HD camcorders and the ARRI ALEXA line of digital cameras. With the added capability to read SxS, SxS Pro and SxS-1 cards, it is the high speed SxS memory card reader. It enables Thunderbolt technology equipped Mac computers to read SxS cards at over 100 MBps. Note! * Sony's Thunderbolt technology-compatible SxS driver for Mac OS X may be downloaded from this Sonnet support link. 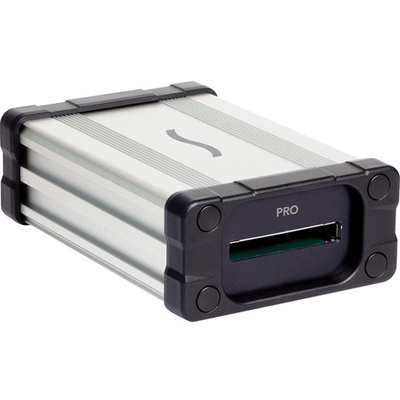 The Echo Pro ExpressCard/34 Thunderbolt Adapter enables you to use ExpressCard/34 adapters with Thunderbolt technology equipped computers to expand your computer's connectivity and capabilities. This adapter ingests footage from SxS memory cards at up to 100 MBps. It features high-performance 10 Gbps Thunderbolt technology, 5.0 Gbps ExpressCard 2.0 or 2.5 Gbps ExpressCard interface. The adapter supports common ExpressCard/34 adapters as well as Sonnet Pro CompactFlash and SDXC readers; FireWire and selected eSATA adapters. It also enables use of Qio CF4 and Qio E3 pro media readers in computers which are Thunderbolt technology enabled. The Echo Pro ExpressCard/34 Thunderbolt Adapter supports ExpressCard adapters for specialty devices such as AJA io Express and Prism Sound ADA-8XR and Orpheus.